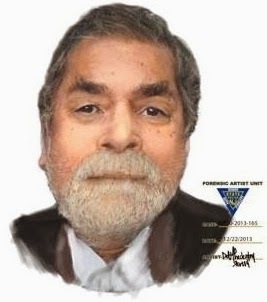 UPDATED: According to Asbury Park Press, NJ State Police have released an updated colored rendering of the unidentified man. Eagleswood, N.J. - State troopers from Tuckerton Station are investigating the suspicious death of an unidentified man found in the Stafford Forge State Forest yesterday at mid-day by two people walking a dog. There was no obvious signs of trauma. An autopsy was performed yesterday, but the cause and manner of death have not yet been determined. The man had no identification and troopers are seeking the public's assistance to identify him. 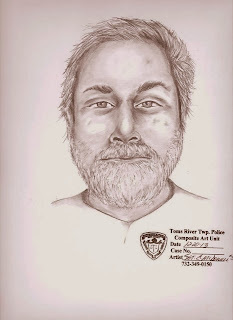 The Toms River Police Department today assisted the investigation by creating a sketch of the man for distribution. He is described as between 5-05 and 5-08 tall, and between 130 and 165 pounds. The man is believed to be of Hispanic heritage and may be between 50 to 60 years of age. Any information to aid this investigation can be called in--even anonymously-- to Det. Sgt. Simonson at Tuckerton State Police Station at 609-296-3132.